The Ansell HyFlex 70-123 55.9cm Cut-Resistant Kevlar Sleeve is a knitted protective sleeve manufactured from tough and reliable Kevlar fibres for superior resistance to cut and tear. Protecting against contact heat up to 100°C, and featuring a thumbslot for wrist protection, this sleeve is ideal for a wide range of medium-risk applications in the automotive, construction, glass and metal fabrication industries. The HyFlex 70-123 Sleeve is manufactured from 100% DuPont Kevlar to offer a high cut-resistance-to-weight ratio. As a result, this sleeve provides excellent protection against cuts, while remaining lightweight for maximum user comfort and dexterity. Featuring a thumbslot for additional protection, the HyFlex 70-123 Sleeve shields both the arm and the wrist against harm. This makes the sleeve suitable for more manual handling tasks, and when worn with a protective glove provides full protection from the elbow down. This sleeve is available in one size, which should fit most users. The sleeve has a length of 55.9cm. 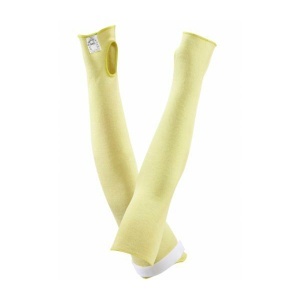 Please note that the price listed is for one HyFlex 70-123 Sleeve only.